Sinus surgeons with The University of Texas Health Science Center at Houston (UTHealth) and Memorial Hermann-Texas Medical Center are the first in the United States to use augmented reality technology during minimally invasive sinus procedures. "Augmented reality, which uses 3-D mapping and imagery, enhances our understanding of complex anatomy so surgical procedures are more precise," said Martin J. Citardi, M.D., chair of the Department of Otorhinolaryngology-Head and Neck Surgery in McGovern Medical School at UTHealth. "The addition of augmented reality to a surgical navigation serves as a GPS-like system and offers patients the benefits of minimally invasive surgery with lower risks and better outcomes." The initial uses of the technology included a March 2 case at Memorial Hermann-TMC in which Citardi performed revision image-guided functional endoscopic sinus surgery for recurrent chronic rhinosinusitis. In addition, the patient also had a fibro-osseous lesion blocking drainage from the left frontal sinus. "This was a complicated case. By using this technology, we were able to plan a pathway to drain that blocked frontal sinus and avoid the need for a more extensive procedure," Citardi said. 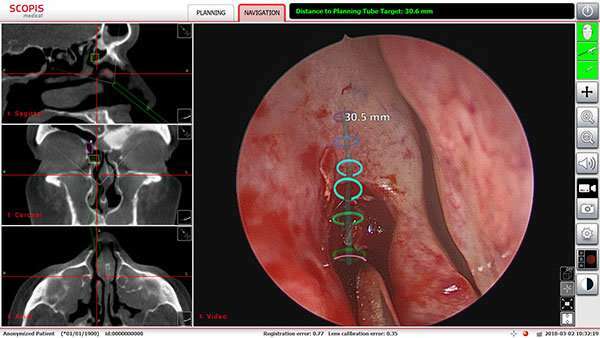 Citardi believes augmented reality technology has the potential to improve many types of sinus procedures, including those performed for chronic rhinosinusitis, sinonasal polyps and even tumors. The surgery was performed using Stryker's Scopis Target Guided Surgery (TGS) technology, a system designed to give surgeons the tools to plan pathways and critical structures in preoperative medical imaging scans. During surgery, this planning is overlaid onto the surgeon's endoscopic view of the surgical area. The system assists the surgeon in following the defined pathway and avoiding critical structures.